The late Jang Jun-Ha (張俊河: 1918-1975) was an independence fighter against Imperial Japan, was a political rival of late strongman Park Chung-Hee, and was a publisher of a mass-circulation political magazine Sasanggye (思想界). Sasanggye's circulation reached over 100,000 copies. The political magazine was read by most intellectuals and loved by all the pro-democracy leaders. At the height of his fame as a political activist he was virtually assassinated by then President Park Chung-Hee, the absolute ruler of South Korea's military dictatorship in mid-1970s. 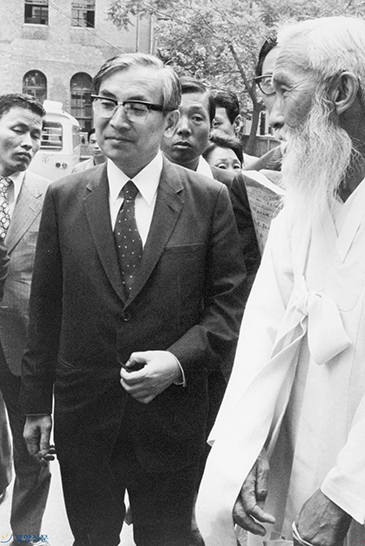 On the morning of August 17, 1975, Jang was taken from his home by two secret agents to a mountain hiking on 489-meter Yaksabong or Yaksa Peak in Idong-myeon, Pocheon-gun, in Gyeonggi Province just north of Seoul. Next day he was found to be dead on the peak. The government announced that Jang slipped over a cliff to his death without careful and through investigation. Under iron rule of military general turned politician President Park Chung-Hee's government no new media was brave enough to raise any questions over Jang's mysterious death. Jang was a dissidents' leader at the time. He was hugely popular enough to threaten his political rival President Park who was seeking permanent power as the life-time president. Critical of Park's dictatorship Jang was arrested 37 times and was incarcerated nine times by Park's regime. Jang was the biggest political rival to Park. When the Korean Peninsular was under Japan's colonial rule Jang was a captain of Liberation Army of Korean government in exile in China. In contrast Park was an Army officer of Imperial Japan, cracking down on independence fighters of Korea and China in Manchuria. Park is the father of the disgraced ex-President Park Geun-Hye now in jail over her abuse of presidential power. Her father ruled South Korea close to 20 years before he was assassinated by hir right-hand man in 1979. In 1961 Gen. Park seized power by coup d'etat. On August 15, 1945 Korea was liberated from Japan as it surrendered unconditionally to the US at the end of the Pacific War. When Japanese Army withdrew from Manchuria to Japan Park was left alone, not knowing where to go. He decided to go join his former enemy, the Liberation Army of Korean government in exile in China. Jang was waiting for Park to arrive. Upon their meeting Park was excoriated by Jang. "Mr. Park you sure would keep slaughtering independence fighters like me had Japan not surrendered to the US," Jang told Park. After seizing power by military force Park was not comfortable with Jang's presence in South Korean politics. Jang knew so well about the past history of Park. Plus, Jang was emerging as a strong presidential candidate to challenge Park. The truth of Jang's tragic and mysterious death has yet to be revealed after nearly four decades passed.